Maternity services at Epsom and St Helier hospitals will be investing over £46,000 in additional services and support for pregnant women with a BMI (Body Mass Index) of 30 and above, who may be at higher risk of experiencing complications. New figures show that Epsom and St Helier hospitals saw a record number of patients last year, with more than 896,230 patients coming to the trust for treatment in 2015 – that’s an increase of more than 11,000 people compared to 2014. As a hospital trust that sees more than 885,000 patients every year and one of the largest local employers, it is important that Epsom and St Helier hospitals invest in taking care of the people who take care of the public. 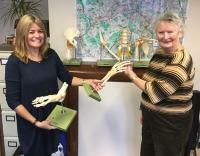 The South West London Elective Orthopaedic Centre (SWLEOC), based at Epsom Hospital, has taken delivery of eight new models that will be used for research into osteoporosis (a condition which makes bones brittle and fragile) and to help explain different conditions and surgical procedures to patients. The most senior doctors at Epsom and St Helier hospitals are calling on local people to stay warm and well this weekend, as the weather forecast predicts widespread frost and a low of minus three degrees Celsius.